This article describes how to setup a simple automated call distribution by using custom voicemail XML script. In most cases it is possible to distribute incoming calls on innovaphone PBX as desired by using PBX features like a broadcast call, waiting queue and user groups. 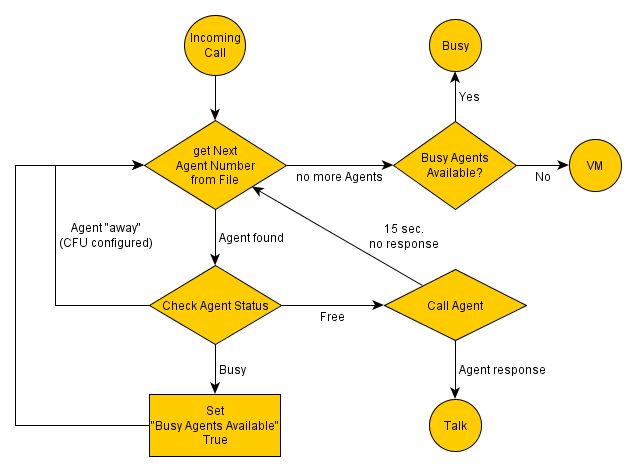 But some scenarios require more complex call routing between user objects. For this purpose a custom XML voicemail script can be used to implement a desired call distribution scenario. agent is not responding after 15 sec. Please note, that this script is exemplary and free and can be modified to fulfill your special requirements. Create a new folder on the compact flash card e.g. "acd". Place a files provided in the download section in this folder. Create a new voicemail object in the PBX with URL http://127.0.0.1/drive/CF0/acd/acd.xml?$_pbxfwd=true. Make sure there are no administrative CFUs (using boolean, "only not for" etc.) configured on the PBX users/agents. Make sure the CFNR Timeout is longer than timeout defined in the ACD XML Script. CFNR defined on User Objects with no registered device are executed immediately. If "No Answer" on Trunk Object is configured, configure a CFNR on the ACD VoiceMail Object with "-" (minus sign) as number (see Reference7:Administration/PBX/Objects/Edit CFs for more information). http://download.innovaphone.com/ice/wiki-src#linearacd - download the complete file package of scripts and files described in this article. This page was last modified 14:58, 25 February 2019.